The Solomon Islands has beaten Tahiti to win the rights to host the 17th Pacific Games in 2023. Vietnam has been confirmed as the host nation for the 31st Southeast Asian (SEA) Games in 2021. Following the Memorandum of Understanding (MoU) that was signed between the city Ulaanbaatar – represented by Mr. Bat-Uul E., the City Mayor; Mr. Bayasgalan D., the President of NUSF Mongolia with FISU, represented by Mr. Claude-Louis Gallien, FISU President and Mr. Eric Saintrond, FISU Secretary General/CEO – where the City has the intention to organise the 2033 Winter Universiade, and where both sides agreed to cooperate in the frame of the ‘2033 Winter Universiade – Ulaanbaatar Project’. Within the framework of this MoU, Mr. Milan Augustin, Director of the Winter Universiade and Mr. Roger Roth, Chair of the FISU International Technical Committee of the FISU Winter Universiade, visited Ulaanbaatar between October 6-10, 2015. The inspection visit was divided into three parts. First of all, the Winter Universiade Organisation workshop was held in Ulaanbaatar’s City Hall. Around 60 representatives from 20 different institutions and universities attended the seminar, including the Ministry of Health and Sports, Ministry of Education, Culture and Science, City Government department of Sports, NUSF Mongolia and the National Winter Sports Federations (NSF). FISU delegates gave information about the FISU, the Universiade and the minimum requirements for hosting a Winter Universiade. The WU workshop was a successful event, with a dynamic participation from the attendees who were actively interacting and sincerely desiring to organise a Winter Universiade in their home country in the near future. 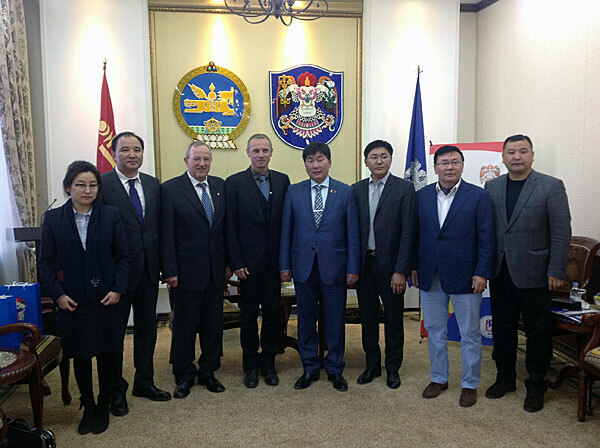 In addition, the FISU Winter Universiade delegates met with high-placed authorities of Mongolia and the City Government. Separate meetings were held with Mr. Enkhtsengel Ts., the Deputy Mayor of Ulaanbaatar City and the Head of the working group for the future Winter Universiade; Mr. Boldbaatar T., the Deputy Minister of Health and Sports of Mongolia; Mr. Bayasgalan, the President of the Mongolian Students Sports Federation and Treasurer of FISU and Mr. Odbayar O., the Chairman of the Department of Capital city planning of City hall, together with the department’s staff, Presidents and Secretary-Generals of the national winter sports federations of Mongolia. FISU officials inspecting the Sky Alpine Resort. Finally, the inspection visit ended with site visits to some of the proposed sports venues and representatives were also acquainted with the concept drawings for the Universiade Village that will be built in the future. The venues visited included the Sky Alpine Resort in the Bogd Khaan mountain area, the Buyant Ukhaa Sports Palace, which was assessed for the possibility of using it for ice hockey purposes, the Khandgait Resort ice rink inspection, outdoor speed skating stadium, cross country skiing and biathlon areas for building snow sports facilities. The FISU delegates also travelled to the Berkh Mountain in Gachuurt village to assess the possibilities of alpine skiing facilities that will be constructed for the future and a Universiade Village area for student campus ‘Nalaikh’ in the Khonkhor area. Work meeting with the Deputy-Minister for Sport. During their visit, delegates discussed about a future collaboration between FISU and the City Government of Ulaanbaatar, to share their experiences, exchange ideas on the working plans to prepare for the Universiade, evaluate the conditions on site, and to define some other arrangements with FISU. It was also agreed that in the forthcoming years the parties will advise one another on the venue constructions to be built in Ulaanbaatar under the frame of the ‘2033 Winter Universiade’ project, while the local parties will do some research on opportunities to organise FISU World University Championships, such as speed skating and ski orienteering events in Ulaanbaatar, as interim steps to comply with FISU standards and ISF rules. At the end of the inspection, the FISU representatives issued the ‘Official Recommendations’ to Mr. Enkhtsengel Ts., Deputy Mayor Ulaanbaatar City, Head of the working group for future Winter Universiade to give the necessary suggestions for further processing to the authorities of the City Government, which included the outcome of their visit. According to the recommendations, a study team will be formed, which will work on the organisation of the Winter Universiade, while learning from the experiences of other cities that have hosted and/or will host the Universiade in the future. Also, the FISU delegates recommended that infrastructure facilities should be built closer to the city and be available for general use afterwards, as a legacy after the Universiade. Finally, the FISU WU delegates completed their three-day visit in Ulaanbaatar, assessing that the City of Ulaanbaatar is indeed a potential candidate for the Winter Universiade in terms of its weather conditions, natural environment and territory if the team would focus on the long term concept. Hangzhou, the capital of China’s Zhejiang province, has been awarded the rights to host the 2022 Asian Games. The southeast coastal Chinese city, with a population of 8.9 million, was the lone bidder for Asia’s flagship multi-sports event. Hangzhou mayor, Zhang Hong Ming, led the bid city’s delegation, delivering a 15-minute presentation to the Asian NOC leaders at the OCA general assembly in Ashgabat, Turkmenistan. He promoted the bid as “secure, reliable and risk-free”. 2004 Olympic swimming champion, Luo Xuejuan, a resident of Hangzhou, contributed to the presentation. The former Chinese breaststroke world record holder will serve as a Games ambassador. The host city contract is signed in Ashgabat (Image courtesy: ATR). OCA President, Sheik Ahmad Al-Fasal Al-Sabah, put the bid to the Asian NOC leaders saying, “It’s the only candidate but it has achieved a lot of the goals in our house”. The bid was approved by acclamation and the host city contract was signed. Hangzhou will host the Games from September 10-25, 2022, just seven months after Beijing stages the 2022 Winter Olympics. The athletes’ village will be located 5km from the Hangzhou Olympic Sports Park’s main 80,000-seat stadium (which is featured both on the cover and within the latest Q3 edition of PanStadia & Arena Management magazine); the centrepiece for the 2022 Asian Games. Visitors to Games can arrive via the 45-minute high-speed railway linking Hangzhou to Shanghai. Hangzou, which markets itself as “Paradise on Earth”, has hosted women’s World Cup football and the world table tennis tour finals. The picturesque coastal city will also host the FINA World Short Course Championships in 2018. Chinese IT giant Alibaba will serve as Hangzhou’s marketing partner for the Games. Main image courtesy: NBBJ, taken from the front cover of the latest Q3 edition of PanStadia & Arena Management magazine. For all the latest stadia and arena project news, make sure to check out the comprehensive Facility Watch that is featured in each and every issue of PanStadia & Arena Management magazine. You can also find out about all the latest sports venue developments from across Asia Pacific, and wider afield, at this month’s must-attend Stadia & Arena Asia Pacific 2015 event. Delivering the world’s largest Ceremonies Communication system for the inaugural European Games that took place in Baku this June, was Sydney-based company, The P.A. People. In the run-up to Baku 2015, The P.A. People won the contract to provide ceremonies communications (comms), providing two-way radio, intercom, CCTV and technical services. For the Ceremony proceedings, The P.A. People selected Clear-Com intercom systems to handle production communications during rehearsals and both Ceremonies. Clear-Com also provided two support engineers on the ground. The scale of the project was pretty remarkable. In many ways it was a bigger undertaking than Sochi. The other particularly notable aspect of the project was the use of the Clear-Com FreeSpeak II [DECT-based wireless communications] system to cater to the Moving Stage. The production crew did not include full duplex on the original specification, but as the artistic component of the event developed – and after we had been appointed as contractor – it was determined that a full duplex solution would constitute a significant advantage for the Ceremonies. We designed a configuration using two systems in two different frequency bands, and with the support of the Azerbaijani authorities, we were able to operate one system in one local license band and the other outside of that. With the two systems co-located, we could achieve the desired 80 packs in one physical RF space to the satisfaction of all. It was a great achievement. Other elements of the Clear-Com Moving Stage comms specification included a single Eclipse HX Median Digital Matrix Platform, nine HelixNet Master Stations and 70 HelixNet Beltpacks. Comms for general main stadium usage included two Clear-Com Eclipse HX-Omega digital matrix systems and more than 200 IP-enabled intercom panels. Clear-Com V-Series Intercom Panels were also to be found in the rehearsal tent and remote cauldron areas. The P.A. People have highly trained and knowledgeable personnel who know exactly how to get the most out of the systems. A brand new addition to the global sports landscape, the European Games ran from 12-28 June in Baku, Azerbaijan. Sydney, Australia-based firm, The P.A. People, is a stalwart specialist in stadium audio installations and event communications. Examples of large venue systems projects include Stadium Australia, Sydney Cricket Ground and Brisbane Cricket Ground, to name just a few. Baku 2015 will be featured in our forthcoming Q3 (formerly Autumn) ’15 edition of PanStadia & Arena Management – the world’s leading magazine for the business of stadia, arenas, sporting events & venues. US Soccer has revealed the long-list of cities interested in hosting games during the Copa America Centenario in 2016. Twenty-four metropolitan areas of the US have expressed interest in staging games, with final proposals to be made by mid-March. The winning cities will then be revealed in May, with US Soccer anticipating between eight to thirteen stadiums to be used in total; each to have a minimum capacity of 50,000. The US was announced as the host of the special tournament – that will celebrate the 100th anniversary of CONMEBOL, South America’s soccer association – last May. The June event will feature teams from CONMEBOL and CONCACAF, which governs soccer in North America and Central America. The interest level from cities across the nation has been phenomenal. Everyone understands the tournament will be a huge event during the summer of 2016, and it’s exciting to see all of these cities putting together bids to be involved. With over 18 months until the tournament starts, we already are starting to see the impact and interest the tournament will have with soccer fans across the United States. The Copa America will be staged as normal later this year, with Chile playing host, before the Copa America Centenario takes place between June 3-26, 2016. Brazil and Ecuador have already been confirmed as hosts of the Copa America in 2019 and 2023 respectively. Set against a black backdrop, the logo features a sleek design of the Copa America trophy in the middle, with red, blue and green curves forming the shape of a soccer ball. The years ‘1916’ and ‘2016’ signify the CONMEBOL’s upcoming centennial and the streaks of colour circling the trophy represent the two confederations, blue for CONCACAF and green for CONMEBOL. The logo was designed by British-based company The Works Ltd and features a red, white and blue stripe next to the word ‘USA’ at the bottom of the logo, signifying the hosting country for the tournament. We are very proud to be the first country where the final will be held after moving from Monaco. We are ready to make all necessary efforts to make it an unforgettable evening. Prague will be just the second UEFA Super Cup venue since the competition became a one-off final in 1998 and moved to Monaco, its base for 15 seasons. FAČR coordinating manager Ivo Sekerka spoke in depth about the preparations undertaken at Stadion Eden, which have included laying a new pitch, enhancing the floodlighting and enlarging the media facilities at a ground opened in May 2008. He also discussed the fan zones and signage systems that will be in operation in the city as well as the UEFA Super Cup charity ticket auction launched last week by UEFA.